It may seem odd, but I think my favorite session during my recent visit to General Mills for Table Talk was the session by Green Giant. Two people talked to us from the Green Giant division -- Steve works with frozen food and Alex works with canned food. 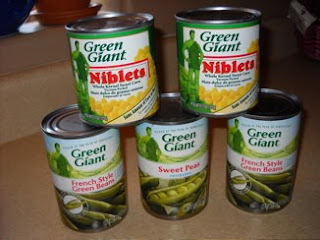 I pulled these cans out of my pantry to show that we really do eat Green Giant vegetables! I didn't pull out the ones from the freezer, but there are a few bags there as well. Lydia and I shared a Healthy Steamer bag of rice & vegetables last night for dinner when the boys were gone. She gobbled it up - even the red peppers! Steve, from frozen food, made us all laugh when he shared that he had a kid's palette, and really didn't even like vegetables until he started working in this division! I was amazed (and pleased!) to learn that they use holistic pest management, and have even gotten to the point where they use NO pest control on their peas! I had just assumed that any large company would use chemical pest control and the only way to avoid it would be to grow my own vegetables, or buy only locally grown produce from farmers I knew. Since the original company's founding in 1903, they have always been interested in sustainability and holistic approaches to farming and harvesting. The Green Giant mission is: Valley Freshness & Valley Stewardship, integrated seamlessly. Their core values are: value, nutrition and taste -- and I feel they are doing a great job incorporating those values in their products. I was thoroughly impressed with the attention and science that goes into seeds, germinating and planting. The company is committed to sustainability practices in Minnesota, and everywhere they harvest plants. I also learned that their 15.1 oz cans and their 11 oz cans of niblet corn have EXACTLY THE SAME AMOUNT OF CORN! The difference is that the smaller can is vacuum packed and has 75% less water. The cans are smaller, which require less material, and less shipping costs. Plus, the corn is a bit crisper because it hasn't been sitting in water. Did you know that fresh green beans lose 50% of their Vitamin C within a week? When green beans are harvested at Green Giant farms, they are processed within 8 hours, which locks in all the vitamins! You'll see some commercials in the next few weeks about that fact, but I thought I'd share it here. I always knew that frozen and canned foods had higher nutritional values in the winter, but I didn't realize how quickly the nutrients drained out of vegetables. We were able to sample some of the new blends, and all were delicious. They have a peas & corn with butter basil sauce coming out soon, and also added some new Immunity blends. We tried one with cranberries that was yummy. The one thing I wish is that they had more frozen choices in larger bags. Most of the bags are 2-3 servings, which means I need to purchase 2-3 bags to feed my family. One of the responses I heard about that was the smaller bags allowed families to offer different vegetables, but at our table, I like to encourage everyone to share the same food. I don't want to get into the habit of making special or separate meals. I do think their single serve options are wonderful for those who live alone (like my sister) and as a snack for kids (and even adults!) In fact, they recently partnered with Weight Watchers and the single servings will soon show that they are either 0 or 1 point on the Weight Watchers system. One thing that shined through, no matter who was giving the presentation, was that everyone believed in the mission and goals of General Mills and truly appeared to love their jobs. If I wasn't so committed to Arizona summers, I may consider moving and trying to work there!